Ken Evans has held a variety of machining and related jobs throughout his career; and is currently a CNC Programmer at a prominent aerospace company. Ken was a Machine Tool Technology instructor for 20 years at Davis Applied Technology College in Kaysville, Utah, where he taught a variety of courses throughout the machining curriculum, including Mastercam CAD/CAM. In addition, he has trained other educators from around the region on how to set-up, program, and operate their CNC machines; and has been a Training & Applications Specialist for a local machine tool distributor. 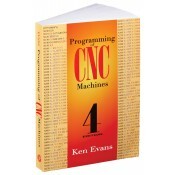 Notify me of updates to Programming of CNC Machines, 4th Edition Sale!